Hi everyone! 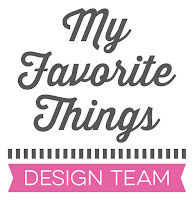 Today is the last day of the My Favorite Things May release countdown. This release is absolutely fabulous! The new products will officially be available on the MFT online store in a few hours!!! Yay!!! Most of the supplies I used for this project are linked in the link-up tool at the bottom of this post. When I saw this fish, I had to think of PacMan and this was my inspiration for this card. 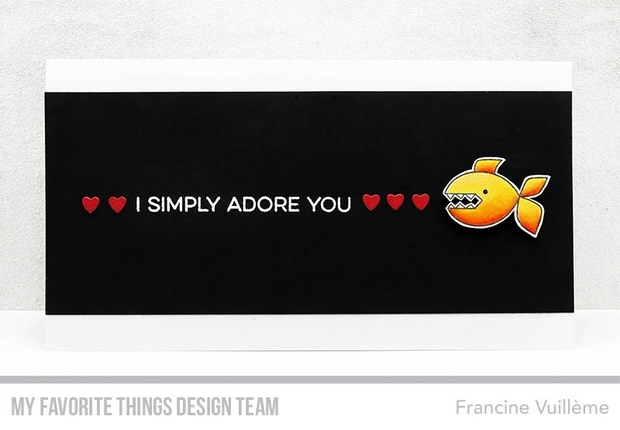 The "pacfish" is from the newest Ocean Pals and the tiny hearts that I die cut from Wild Cherry cardstock are from the Blueprints 11 Die-namics set. I heat embossed the sentiment with white embossing powder. Such a clever design, especially with the black background! LOVE this card, Francine! Great design. The "lovely" fish makes me laugh!!! Cute card Francine. Thanks for the inspiration. Clever and striking use of the pac-fish searching for hearts - so enhanced by the back background! Love your "pac-fish". A very cute idea, Thanks for sharing your fun card. So many great items to play with in this release! I love that you did it on a black background. It makes everything on the card pop. Love the design.